I’ve been marvelling at last week’s Guardian article by Richard Seymour and Ashok Kumar defending Lutfur Rahman, the extremist-linked mayor of Tower Hamlets. Ashok is the man who celebrated Rahman’s election victory under the headline: “The last outpost of the Raj falls.” There are also interesting things online about Richard which open, shall we say, new windows into his views on racism. With friends like these, etc, etc. It’s worth going through the claims from the leaflet (and – where different – the article) to deconstruct some of the things we’ll be hearing endlessly from Rahman and his defenders in the weeks ahead. “Judge me by my record,” he keeps saying. Not, presumably, his and his supporters’ cronyism, favouritism, links with extremism, bullying, intimidation, unscrupulousness and general political sleaze but his many alleged policy accomplishments to help the people of Tower Hamlets. Even some of his opponents half-buy the line that Rahman’s success is due as much to his populist policies as to vote-buying, ethnic bloc favouritism and so on. See what you think once you’ve read this. Claim: A racist smear campaign has been launched against Rahman. Reality: This is presumably a reference to my and other people’s reporting. In fact Rahman and his supporters have lost countless complaints to the PCC and Ofcom about my reporting, which has been upheld on every substantive point. In particular, the PCC ruled that it was not inaccurate to describe Rahman as extremist-linked. The claim of racism is the standard charge made by Rahman against all who question him. But a majority of my sources, including three of those quoted in my latest article, are themselves Bangladeshi. Reality: Decent Homes is a national programme introduced by the last Government in 2000, two years before Rahman even became a councillor and ten years before he became mayor. It is also paid for by the Government – though that hasn’t stopped Rahman sending thousands of publicly-funded direct mail letters to council tenants, claiming the credit. Reality: When abolished in 2011, the full EMA was worth £30 a week, or £1170 per academic year (39 weeks). Tower Hamlets’ scheme pays a maximum of £400 a year and is in any case due to end this summer (p4 of this PDF). Reality: Only 400 bursaries were available – although 800 students from the borough start university each year – and even these were a one-off, given only to students starting in the 2013/14 academic year (p4 of this PDF). Reality: Free school meals have in fact only been introduced in two of the seven primary years – reception and Year 1. Free school meals will be introduced for the other primary years only in September. The cost for the the three infant years will actually be met by the Government under its new national scheme, not by the council. The free meals for junior school children (years 3-6) will be funded by the council, but only for twelve months. It is not clear what happens after that. Reality: Untrue. Tower Hamlets does not pay the London Living Wage to all contractors, as this officer report (para 8.2) makes clear. A number of authorities, including Tory-controlled City Hall, do pay it to all contractors. Nor was Tower Hamlets even the first in London to extend the LLW to contractors. Reality: Untrue – 32 other UK councils do not charge for elderly personal care. Reality: Untrue. In youth services, Tower Hamlets has cut its budget by 65 per cent – double the national average. It is one of only 12 authorities in England to receive an official Government warning about its failure to track young people not in education, employment or training (NEETs). Children’s centres were restructured in 2011 and the service offered from fewer main sites. According to a quarter-on-quarter comparison by the council’s scrutiny committee, the restructuring resulted in 153 fewer classes, 715 fewer hours’ service provided and 3,372 fewer children using the service. Reality: The ban in fact applies only to construction firms which blacklist trade unionists. Tower Hamlets was not the first council to ban such contracts – Hull, for instance, acted sooner. The ban appears to have only symbolic effect because the companies involved in the blacklisting say they have stopped doing it. Reality: Both a police investigation and a separate Government investigation remain ongoing. See my earlier blogpost for an account of the wholly misleading statement issued (and later corrected) by the Met on this issue. Claim: The Electoral Commission found “insufficient evidence to prove an offence” of voting fraud in 2012. Reality: As my detailed post on the issue describes, many of the allegations of fraud were investigated and dismissed not by the Electoral Commission or by the police, but by Tower Hamlets Council – in other words, by people working for Lutfur Rahman. Where the police did investigate, they found “evidence to suggest that offences may have been committed” for at least five – possibly more – allegations. However, their investigation was desultory and made little effort to gather sufficient evidence for prosecution. Mr Zaidi is now, as he was then, political adviser (a council appointee and publicly funded post) to the extremist-linked mayor of Tower Hamlets, Lutfur Rahman. Now his unique communication skills are going to land him in further difficulty. We saw Lutfur Rahman’s ability to mobilise a crowd at the count on Friday, when a huge group of 2,000 Rahman supporters gathered outside the count centre, effectively barricading Rahman’s opponents inside. As the count dragged endlessly on late into the night, Labour’s London campaign director, Sadiq Khan MP, and many others were told by police that they could not leave the building. The returning officer pleaded with those inside not to pass count details to the crowd for fear of them invading the premises. We saw Rahman’s ability to mobilise a crowd at the polling stations on Thursday, when despite the promises of police many stations were picketed by groups of Rahman supporters, through whom voters had to push to reach the ballot box. There are disturbing stories of these crowds following some voters right into the ballot booth to insist that they marked their vote in the correct box. Most of Mr Zaidi’s article is a cunningly worded pitch for Labour to readmit Rahman. That is, of course, the mayor’s great hope of redemption – and there are a few in the Labour group who actually believe it would be sensible to join up with him. There are many reasons why it would not be. It would be a betrayal of all those voters who only last week put their trust in Labour as a force for non-racial, clean and democratic politics. It would place Labour locally in a position of enormous weakness, signalling that they were prepared to accept Rahman and his cronies running the show and signalling their consent to the council’s dodgy practices. The fatal weakness of some in Tower Hamlets Labour is to believe that the Rahman camp are essentially decent people with whom it is possible to compromise. As Team Rahman have surely shown in the last four years, they are vicious and ruthless people who treat compromise as surrender. It would also be highly damaging for the party nationally. 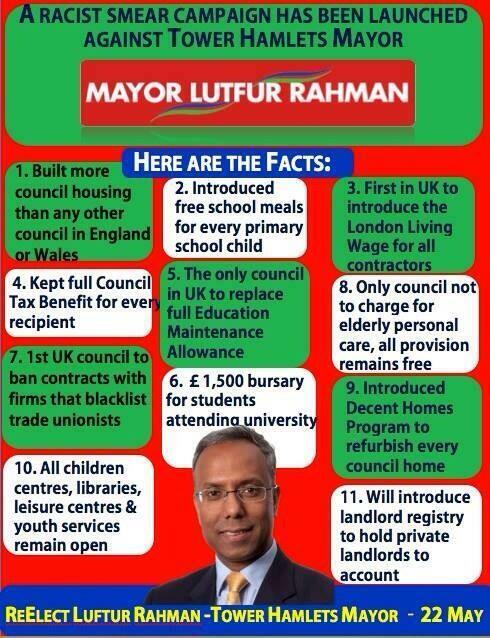 At the moment Rahman is a problem only for Tower Hamlets, not the Labour Party. If Rahman were allowed to rejoin, or any Labour councillors allowed to serve under him, every act of his administration would become Labour’s problem. The mayor is a man whose council is under police and Government investigation for corruption and misuse of funds. The manner of his election win has actually further tarnished him, shaming Tower Hamlets before the country and bringing its extraordinary political culture to much wider national attention than before. And if any more proof were needed of Rahman’s unsuitability for readmission to the political mainstream, today’s words from Mr Zaidi ought to provide it. For a summary of the case against Rahman, click here. For a detailed account of his Muslim favouritism, click here. For a full transcript of my 2010 Channel 4 Dispatches programme on Rahman and his extremist backers, click here. For a chronological account of his career to 2013, click here. Lutfur Rahman, the extremist-linked mayor of Tower Hamlets, narrowly won re-election last night – by 52 per cent to 48 after second preferences – with the help of a repertoire of tactics for which the borough has become notorious. Promises of a police presence at every polling station were not kept, at least for the whole of the day, and even where police were present they were often ineffectual. Large and intimidating groups of Rahman supporters picketed the entrances to many polling stations, remonstrating with some voters who refused to take Rahman leaflets. Other non-Rahman voters may well have decided not to run the gauntlet. Some polling stations were moved to new, unfamiliar, and harder-to-reach locations. One, in the not very pro-Rahman territory of Canary Wharf, was placed on a traffic island, at the bottom of a ramp, in the middle of a busy four-lane road! Some dramatic and highly unexpected changes in vote share took place in wards which Rahman’s Labour opponents had thought completely safe for them. I will be looking more closely at some of these numbers in the days ahead. But the fact that Labour did come pretty close – within 3,250 votes on the final tally – shows that, despite all that, this was an election they could probably have won. Instead, they chose to lose it. Just as the national party failed to take the fight to Ukip, so Labour in Tower Hamlets failed to take the fight to Rahman’s equally chauvinistic, populist and cynical Bangladeshi version. They fought the election almost entirely on conventional local-government issues. When they talked about “cleaning up Tower Hamlets” they meant collecting more rubbish bags from the streets. But Tower Hamlets’ refuse collection is no different than that of many other councils (except, of course, for the large pictures of Mayor Rahman carried on the sides of the dustcarts). Council services are not what is wrong with the borough and were never going to be a strong enough issue to defeat Rahman’s vast bloc vote. As with Ukip, the only attack that could have worked was the direct one – on Rahman’s nastiness, on his indulgent car, office and taxi expenses, on his troubling links with extremists and bigots and on his blatant and unashamed favouritism towards only one of Tower Hamlets’ diverse skin colours. This is a man who has evidenced little more than token interest in anyone who is not Bangladeshi. This is a man whose council is under two separate investigations for corruption and misuse of funds. Yet we heard scarcely a word about that gigantic open goal from Labour’s candidate, John Biggs – he seemed scared to mention it. Rahman, like Ukip, talked directly to his core voters in language they understood – though he had literally nothing to say to anyone else. Biggs, like Ed Miliband, talked in cautious, over-calculated political-speak that didn’t really get the point across. But as the result last night shows, the forces supporting Rahman chose their side long ago and were never going to be won over by clumsy appeals of this sort. They could, however, have been outnumbered and out-organised. Only 32 per cent of Tower Hamlets is Bangladeshi. Not all Bangladeshis, and hardly any non-Bangladeshis, support Rahman. Labour knew that the key to victory was getting the 68 per cent, plus the non-Rahman Bangladeshis, to turn out in numbers approaching the Rahman crowd. The party did raise turnout, greatly. But it didn’t have a strong enough message to raise it by enough. Labour may have calculated – or over-calculated – that direct attacks on Rahman would have allowed him to play the victim and race cards. But he did that anyway, and always was going to. The fact is that Labour, too, had a race card to play. It is a party which represents and draws support from all races. Rahman, by contrast, is a perpetrator, not a victim, of racial favouritism. One of the most disturbing aspects of last night was that, in the council elections happening alongside the mayoralty, the Rahman camp appears to have organised heavily against white Labour councillors but not against (most) Bangladeshi Labour councillors. People who have seen the councillor ballot papers say there is an unusual amount of split-ticket voting, with Bangladeshi councillors of both Labour and Rahman’s Tower Hamlets First party doing far better in several wards than white Labour councillors (and the handful of white Tower Hamlets First candidates) in the same wards. It seems likely, when the council results are announced today, that the council will become even more Bangladeshi-dominated than it already is. As we have noted, only 32 per cent of the population of Tower Hamlets is Bangladeshi. But even in the old council, 60 per cent of councillors were. That could rise even further, to 70 or 75 per cent, today. Round One, the election, has been won by Rahman. Now comes Round Two, the Government investigation, due to report by the end of next month. The narrowness of Rahman’s victory helps here, making it less difficult for ministers, if sufficient evidence is found, to remove him. But it would have been far better if it had been done last night. PS: The Guardian’s London blogger, Dave Hill, polished his reputation as the capital’s sharpest political brain when he tweeted, within about ten minutes of the polls closing: “Think it’s true and now OK for me to say that Labour confident of Mayoral triumph in Tower Hamlets, possibly by a good margin.” Dave has annoyed plenty of people in Labour with his credulous coverage of Rahman – I do hope no one was trying to make him look silly.